These insects are much more effective in combination. Each insect stresses the plant in a different way. 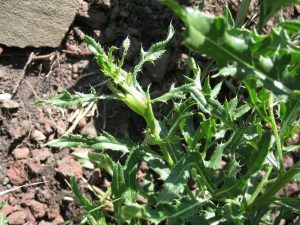 The insects do not compete with each other, but act together to reduce the thistle’s carbohydrate stores required for over-wintering and to lower its competitive fitness against natives. Hadroplontus Litura: The larvae of this hardy weevil hatch on young leaf or stem tissue. 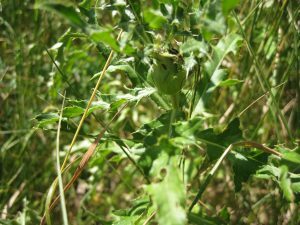 They bore into the plant and mine towards the main stem. Older larvae mine the stem, crown, and root. 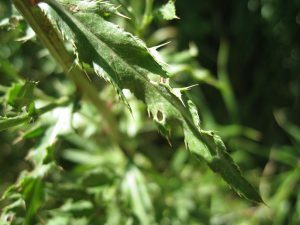 The plant’s root reserves are reduced by an average of 50% in attacked plants. Canadian research showed that the incidence of a fatal rust fungus disease was more than doubled when the insect is present. Urophora cardui: Adult flies lay eggs into stem tissue. The developing larvae then cause the formation of a hard woody gall that robs the plant of energy. Stems, buds, foliage, and flowers above the galls are often malformed or stunted, drying up ahead of unattacked stems. Less energy goes into root reserves required for over-wintering.